The mysterious Samsung handset that was previously expected to debut as the Galaxy A8 Star Lite is now rumoured to debut as the Galaxy A9 Star. The handset with model number SM-G8850 has been spotted in a brief hands-on video. Interestingly, the model in question surfaced on China’s 3C (Compulsory Certification of China) certification website earlier this month alongside the SM-G8750 model that was previously reported to come as the Galaxy A8 Lite. Some live images also leaked online that are rumoured to be related to the Galaxy A9 Star and Galaxy A9 Star Lite. As per the hands-on video posted by SlashLeak folks on YouTube, the Samsung handset with SM-G8850 model number appears to have a glass back panel with Samsung branding and a fingerprint sensor. There is also a dual rear camera setup accompanied by an LED flash module. The front panel of the handset, on the other hand, shows a thin-bezel display along with an earpiece and a secondary camera. The appearance of the Samsung phone in the hands-on video matches the images that emerged on 3C website. While the YouTube video doesn’t confirm the product name, a Weibo post claimed that the SM-G8850 will be launched as the Samsung Galaxy A9 Star. The same model was earlier reported as the Galaxy A8 Star. 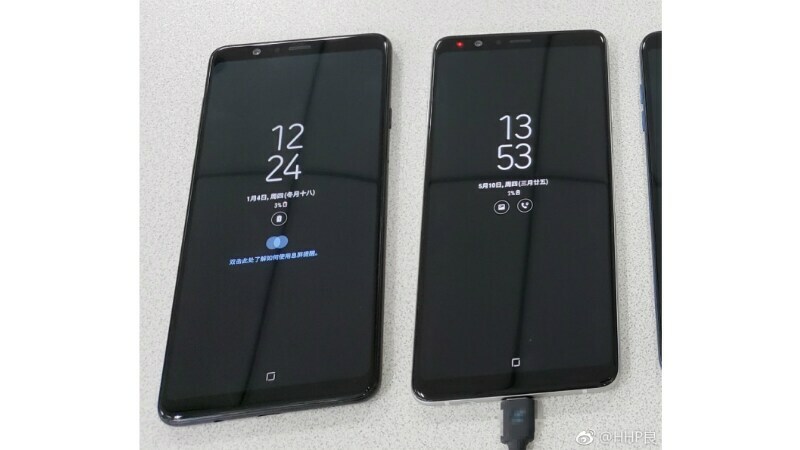 It was also initially rumoured as the Galaxy S9 Mini. Coming to the live images that have been posted on Weibo, the Galaxy A9 Star and Galaxy A9 Star Lite spotted with glass back panels. It is rumoured that the Galaxy A9 Star will come in Black and White colour options, while the Galaxy A9 Star Lite is said to come in Black, Grey, and Blue options. The Galaxy A9 Star Lite appear to have a metal frame and aesthetics of the Galaxy C Pro series that includes the Galaxy C5 Pro and Galaxy C9 Pro. If we believe the Geekbench listing that emerged back in April, the Samsung Galaxy A9 Star will come with a 5.8-inch QHD+ (1440×2960 pixels) Super AMOLED display and will be powered by the octa-core Qualcomm Snapdragon 660 SoC, coupled with 4GB of RAM and 64GB of onboard storage. The smartphone runs Android 8.0 Oreo and packs a 3000mAh battery. Contrary to the Galaxy A9 Star, the Galaxy A9 Star Lite is expected to have a Snapdragon 450 SoC.